The Empanada is a classic pastry in Mexico. 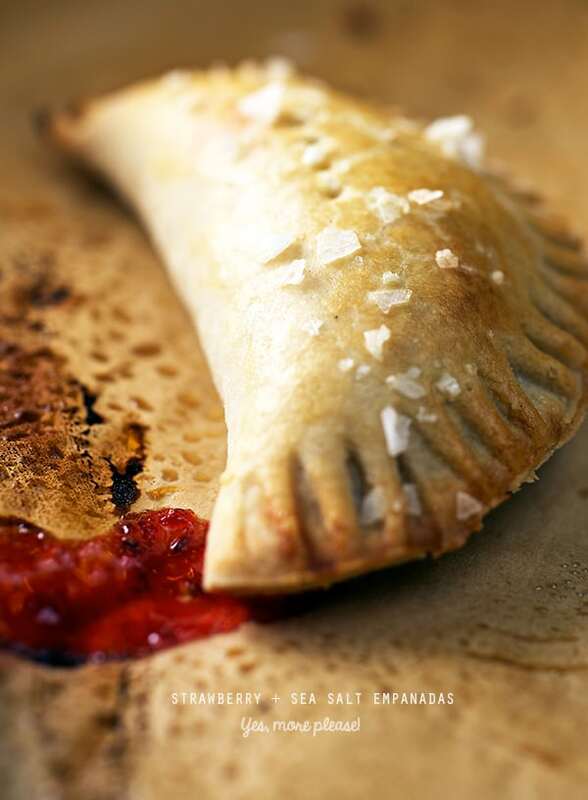 We inherited these pastry pockets of goodness from the Galician people of Spain. If we backtrack to the empanada’s middle eastern cousins ,the samosas, we can trace their origins all the way to Persia. They have been around for a quite while. 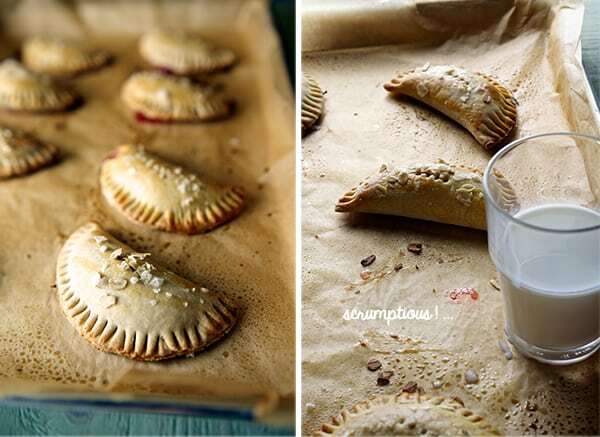 The common denominator of these pastries is a piece of dough that wraps in a half-moon pocket with any kind of filling; sweet to savory, meats, vegetables, fish, cheese, nuts, fruits, you name it! Your craving and the sky are your limit on this one. What makes a good empanada? Is it the filling or the dough? Its like asking what was first the egg? or the chicken?…For me its all about the dough. 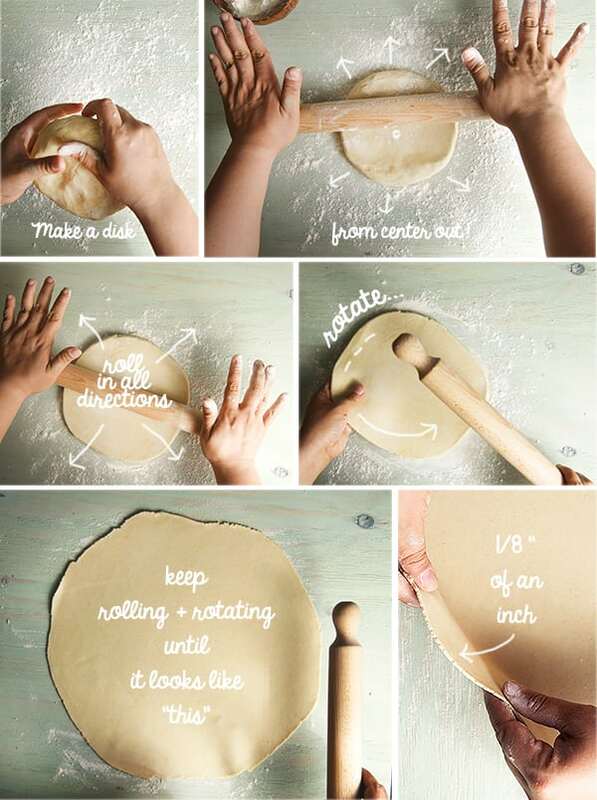 If you have a great dough recipe even the humblest filling will shine. 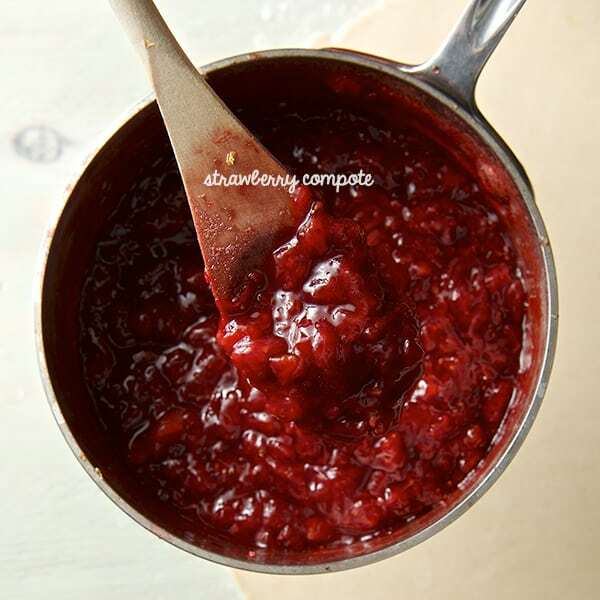 This recipe is all about the dough and a very humble strawberry compote filling. The original recipe calls for lard, which with the years I’ve changed to butter. For this recipe in an effort to not use lard or any other heavy-duty fat I decided to replace the butter with coconut oil, a plant-based fat. This might seem like a fad, but I’m on a mission to demystify this trend. I’ve used it in a couple of recipes, with great success and flavor. So if the healthy bonus come along that’s even greater! Also I’ve substituted half of the white un-bleached flour for oatmeal flour. The results are delicious. 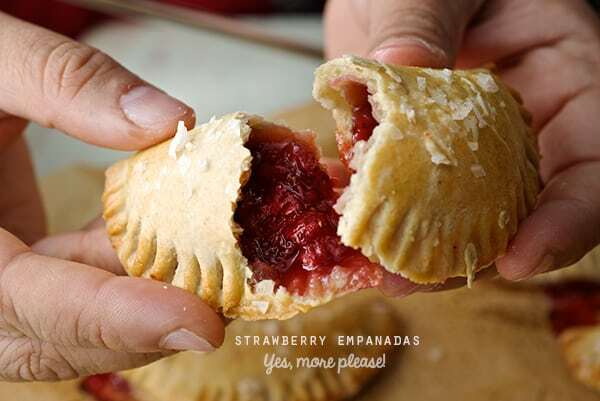 The empanadas are light and flavorful, easy to digest, with no caloric remorse, and best of all an oatmeal empanada can technically be a breakfast of champions! Hehehe. For the filling I used strawberries, honey and lemon to make a simple strawberry compote. Three perfect natural flavors in harmony. And for the final touch some sea salt flakes on the crust. Oh my when you take a bite of these babies its heaven. 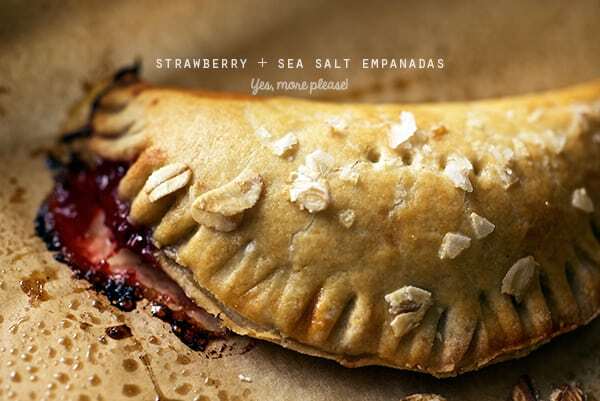 They have a light crust, not too sweet, and the sea salt flakes add tons of attitude, they brighten up the strawberry filling and balance the sweet flavor. This recipe is a winner and I truly believe You are gonna love them. 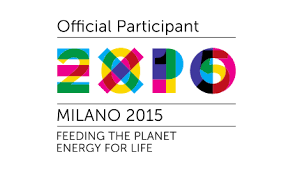 I would love to hear back from you if you make them, shoot us some comments do not forget to share…Enjoy! 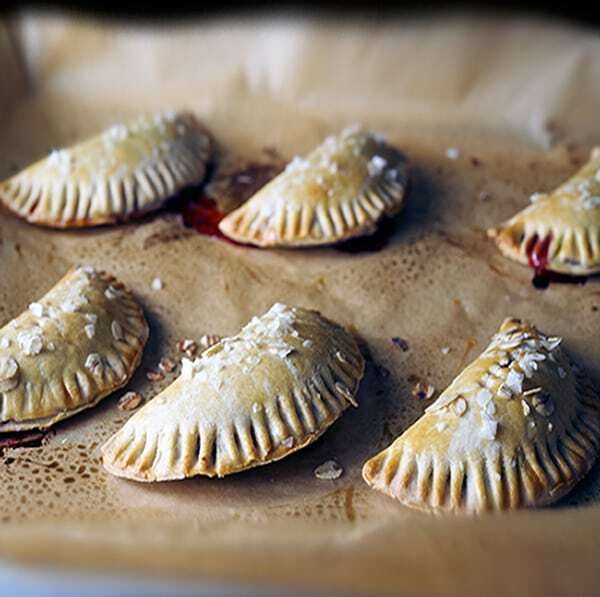 Other empanada fillings: peach & ginger, apples, strawberry and peanut butter, raspberry, mangos, pineapple! Or any savory flavor will work too…strawberry & peanut butter wha?! Makes 12 empanadas, recipe can easily be doubled for a bigger yield. 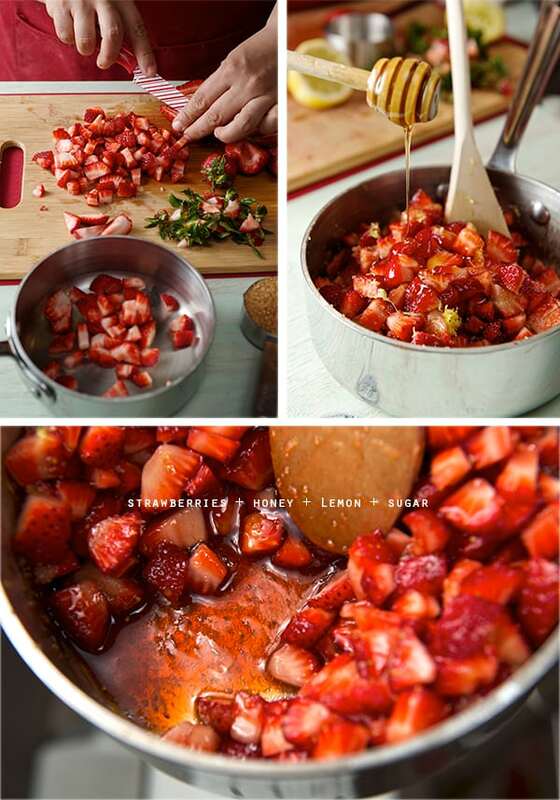 ¼ -1/3 cup turbinado sugar, upon how sweet or tart your strawberries are, start with ¼, taste, and add more if needed. 1 egg + 1 teaspoon water for egg wash.
1. 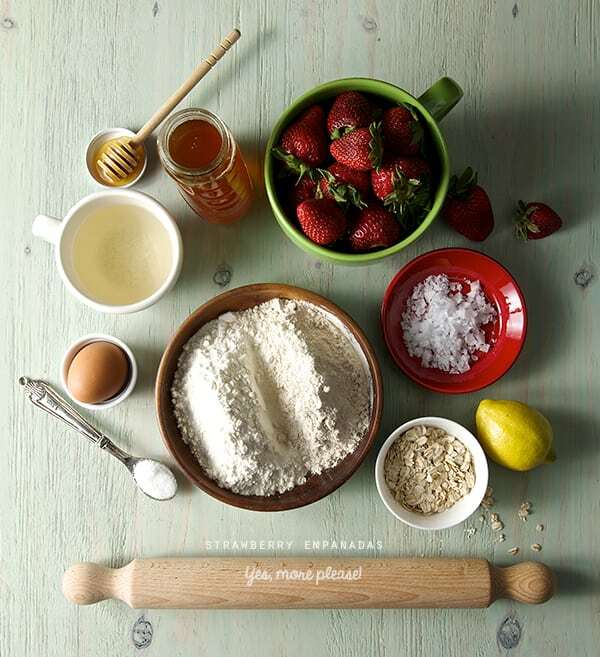 Combine dry ingredients, whisk. 2. Add coconut oil in solid form mix using your fingers until the flour resembles coarse sand. 3. Add egg yolk and mix. 4. Add white wine little by little and mix with your hands until well incorporated and you form a ball. 5. Knead the dough for about 3-4 minutes until smooth. 6. Cover with plastic wrap and refrigerate for about 1 hour. In a small non reactive pot (stainless steel preferable) combine diced strawberries, turbinado sugar, honey, lemon zest lemon juice. Mix well until sugar is dissolved by the strawberry juices. Over medium heat, bring to a boil and simmer for 4-5 minutes. Attend at all times, you don’t want a sugary foam all over your stove!. Remove from burner set a side and cool. 3.Egg wash the perimeter, place a little less than a tablespoon of strawberry compote on the center of the dough and fold the circle in half making a half-moon. 4. Slightly press the edges to seal the empanada, place on a floured surface and with the help of a fork press all the edge to seal it. 5. Place them as you go on a baking sheet lined with parchment paper or a silpad for best results.Proceed with the rest of the dough until you have about 12 empanadas. 8. With a pastry brush apply egg wash and sprinkle some sea salt and oat flakes. Bake at 375F for 10-12 minutes. 9.Remove out of the oven and let them sit for a minute or two, transfer to a cooling rack, before you eat them all!! !